CHF president & volunteers visited VA Hospital in NYC on December 10th to distribute 120 blankets, hats, gloves and leg warmers to the veterans. It has been CHF’s tradition to coordinate with American Legion & American Legion Auxiliary in NYC to bring veterans Holiday gift each December. 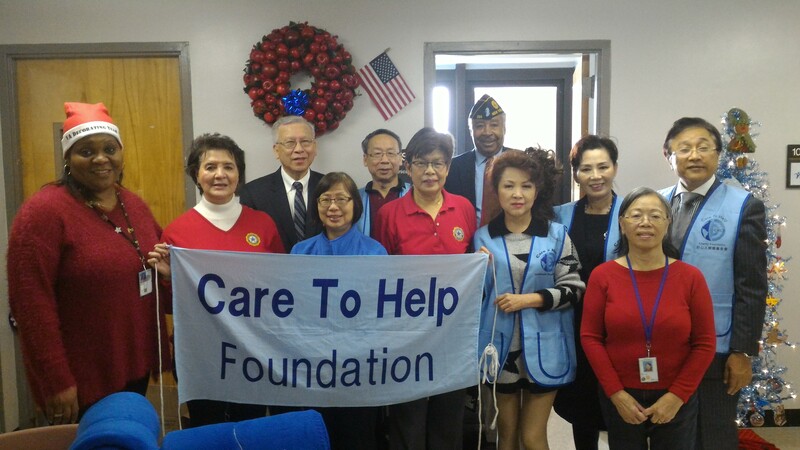 Rod Roderick, American Legion NY County Commander & Fang Wong, former National Commander of The American Legion joined volunteers to distribute the gifts to veterans in the hospital. Barbara Wong, Vice Chair of Auxiliary Emergency Fund and Fanny Hom, VA Holiday gift shop coordinator, volunteers and VA hospital volunteer service staffs worked gather to assemble the gift bags then distributed to different units in the hospital. Some of the nurses and aids in the station gave volunteers a warm welcome by singing Holiday songs.